After about ten years of procrastination, and two years of production, HOME WORK is done. For some 20 years I've been shooting photos, gathering information, and interviewing builders. Not full time, but wherever I travel, I document small-scale, home-size, hand-made buildings. It's an interest I've had ever since building my first house in the '60s. 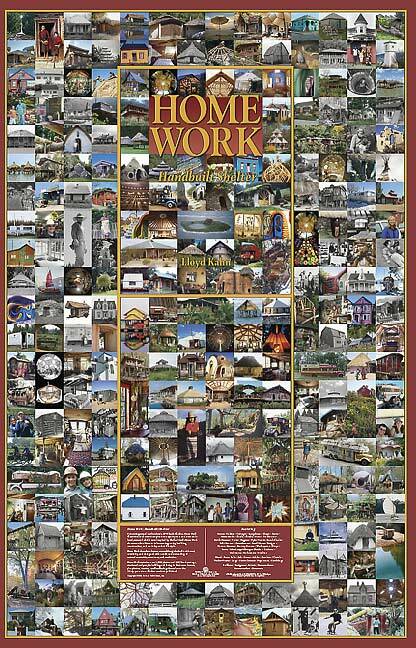 Home Work was a huge task for us, uncharted territory. There are over 1000 photos, which came from slides, negatives, prints, and digital sources. All the scanning, preparation, and production of electronic files were done in-house. I did rough layouts using a little HP Color Copier machine and artist David Wills tuned up the designs. Lew did all the scanning and Rick built the book in QuarkXpress and Photoshop. There was no master plan for Home Work. We had a ton of accumulated material -- photos, interviews, letters -- but no idea how it would all fit together. So we just started. "You never know what's shakin' until you give it a shake." We put it together a page at a time, a day at a time. A bunch of material came in while we were in production, so the book continually changed form. As we went along, it took on a life of its own. After about a year, it seemed to have organized itself into ten distinct sections. This is the first book we have done "disk-to-plate," and it was a huge learning experience. DTP means that the plates for printing the book are generated directly from our electronic files. There is no film, as was the case in the printing industry until relatively recently. Technology marches on! We worked painstakingly with our printers to assure that what we saw on our screen and printed out on our inkjet printer was identical to the colors of the finished product. I went to China to oversee printing. C&C Offset's plant is located in mainland China, just north of Hong Kong. The book ran on a computerized state-of-the-art Heidelberg sheet-fed press. The press men, all amazingly under 30, worked in two 12-hour shifts and ran a 16-page signature about every two hours for 3-1/2 days. To check each one I had to sleep in one-hour snatches. but the results were worth it. When the press guys see that a publisher cares enough to be there (let alone travel halfway across the world), they make an extra effort. We fiddled with colors on each signature at first and then as time progressed they would have the colors nailed by the time I got there to check. After the press check, I took off for Cambodia and Laos with a backpack (and two digital cameras). Hard to believe that I'd never been to Asia. I had a great 3-week trip, eventually getting up to the less well-travelled northern provinces of Laos. I shot about 1000 photos -- temples, bamboo bungalows, villages, rice fields, rivers and mountains, vehicles and river boats. More on this later. The craftsmanship of the printers had produced something beyond what I'd envisioned. They'd added something special in the manufacturing. It looked solid, felt meaty, like it was something of substance. With Home Work, we are going back to our roots. We started in the early '70s with a book on domebuilding, then in 1973 published Shelter, which covered handbuilt housing around the world, as well as young American builders of the times. In the next two decades we produced a series of fitness books. Now I'm excited to be back to the subject of building, where my heart has always been. I'm fascinated with the process of building and the way things are put together. It should just about be arriving in bookstores now. Two weeks ago we sent out over 500 copies to reviewers, contributors, friends, buyers. If you know any reviewers or buyers who should see the book, let us know and we'll send a review copy. We don't believe in advertising; instead we send out lots of free copies. We'll be sending out a publicity recap to reps in the near future. Check the latest version of Shelter's website. 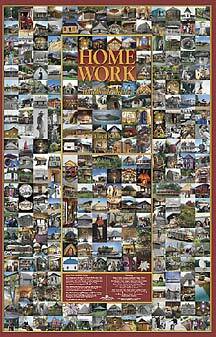 Want a HOME WORK Poster? In the last several years, we have updated STRETCHING, GETTING STRONGER, GETTING IN SHAPE and GALLOWAY'S BOOK ON RUNNING. These books continue to sell well. Jeff Galloway's second running book, MARATHON: YOU CAN DO IT!, is the most popular book on the subject and has been the basis for tens of thousands of people running their first marathon. STRETCHING is now being translated into Turkish. which makes for editions in 29 languages and well over 3 million copies sold worldwide. Both GETTING STRONGER and GALLOWAY have sold over 600,000 copies. Our production studio is built out of recycled lumber and windows, and set in the middle of a garden in a small town in Northern California. We're sort of on the interface between suburbs and pure country, a "seam between the civilized and wild worlds," as Native Plant Person Judith Larner says. It's a great place to work, and made possible by being hooked into the world with four MacIntosh computers. It's what writer Gene Youngblood predicted in a Rolling Stone article in the early '70s as "the electronic cottage." There are six of us who work here, varying hours on various days. I'm constantly amazed that for over three decades Shelter has survived. I've been able to make a living doing what I love. I mean, I'd make books if I DIDN'T get paid for it. Such is the compulsion to communicate. Note: The following is extracurricular and doesn't have anything to do with publishing and is pretty long and is fun, so you should not be reading it at work.